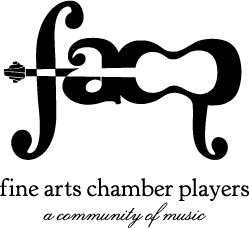 On July 27, 2014, Fine Arts Chamber players hosts the last free concert of the 34th Annual Basically Beethoven Festival. 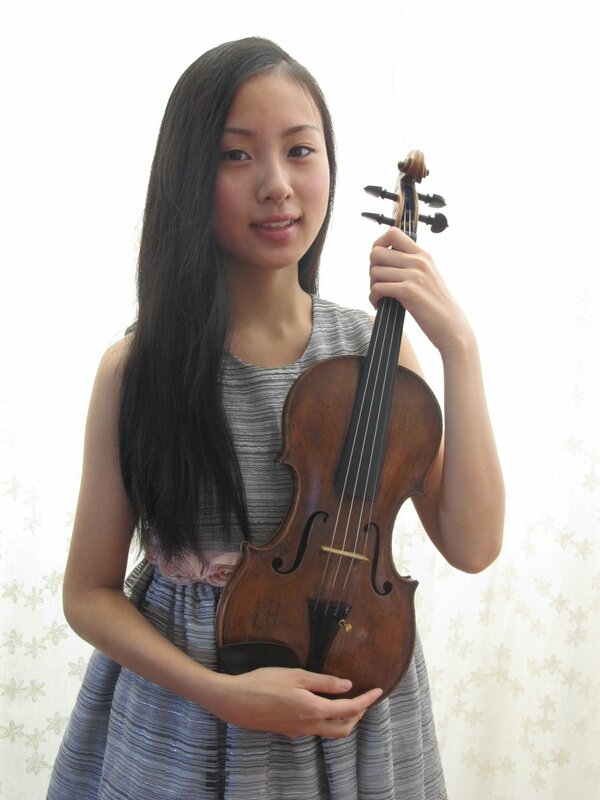 Violin virtuoso Samantha Choo takes the stage for the Rising Star Recital at 2:30pm. Choo was named the 2013 winner of the Greater Dallas Youth Orchestra Concerto Competition and the Lake Lewisville Symphony Vernell Gregg Young Artists Competition, Junior Division. At 3:00pm, Mark Houghton, Camille King and Carol Leone present one of Schubert’s rarely performed works, Auf dem Strom for horn, soprano and piano. Leone continues with a solo piano performance of Beethoven favorites includingthe opening movement of Sonata No. 14 in c# minor, Op. 27 “Moonlight Sonata”, the second movement of Sonata No. 30 in E major, Op. 109 and the classic Für Elise. Barber’s Summer Music for woodwind quintet closes the concert. Doors open at 2:00 pm. All concerts are FREE TO THE PUBLIC and held at the Dallas City Performance Hall in the Dallas Arts District at 2520 Flora Street, Dallas, TX 75201. Paid parking is available in surface lots and garages in the Dallas Arts District. Families with children are welcome. For more information call (214) 520-2219, email music@fineartschamberplayers.org or visit our website at www.fineartschamberplayers.org. The Basically Beethoven Festival is made possible in part by The Dallas Foundation – Presenting Sponsor, the City of Dallas Office of Cultural Affairs, TACA, the Texas Commission on the Arts, the National Endowment for the Arts, WFAA Channel 8, WRR-FM Classical 101, DART, Ben E. Keith, UT Arlington and Sloan Bergmann Print Services. For over 34 years, FACP has presented free classical music programs for the enrichment of North Texas area residents. 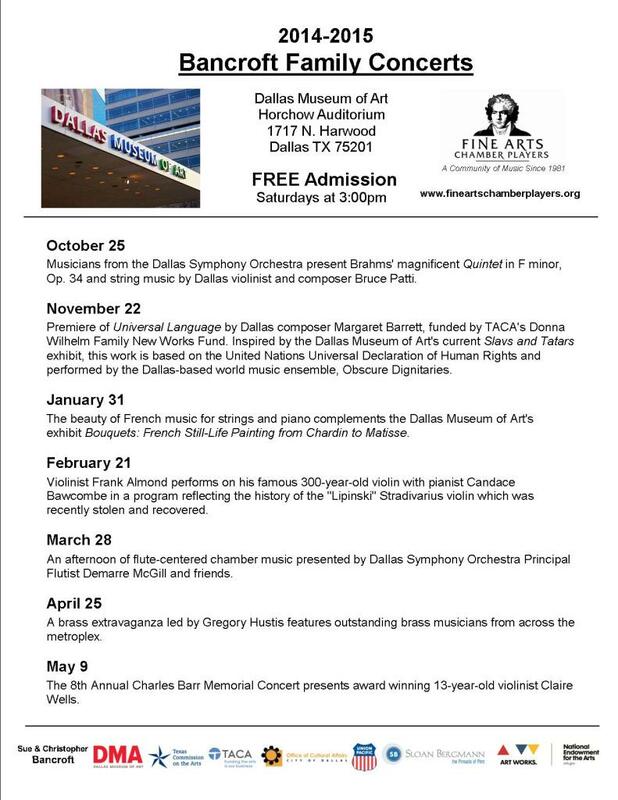 In addition to the free Basically Beethoven Festival, FACP presents the free, monthly Bancroft Family Concerts October through May at the Dallas Museum of Art. Each year, FACP’s educational outreach programs, Dream Collectors and Community Classics, provide over 500 free educational classes and performances in area public schools. Since its inception in 1981, FACP has served over 215,000 children and performed for over a half-million residents of North Texas.